We believe that music should last a lifetime! UNI CMS offers classes for preschool children through senior citizens. Private lessons are offered on an individual basis to beginning through advanced students. Lessons are given year-round and students may start at any time during the year. Music theory basics and the development of technical and musical skills are included in lessons. Recitals and performance classes are offered throughout the year. Have you ever wished that you took piano lessons as a child? Do you wish that you had never quit taking pianos lessons? Now's your chance to make your piano playing dreams come true in a fun, no pressure adult group class! This course, for adults with little or no previous experience playing piano, provides an introduction to the fundamentals of piano playing. 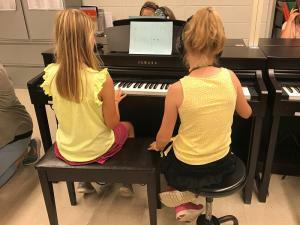 In a hands-on piano lab group setting, students will be introduced to the piano and music fundamentals. Registration and more information on the class can be found on the Tuesday Tunes page. This group piano meets weekly in Russell Hall on UNI’s campus. The class will culminate with a performance on UNI campus for family and friends. For more information, please visit the Music Friends Piano Program page.